Who doesn’t love a new duvet cover? There is nothing better than climbing into a freshly made bed with a brand spanking new duvet cover on it! Okay, maybe if it was ironed it would be even better but me and the iron do not get on very well and if I had any spare time to iron i’d rather spent it in the bath or napping! This snuggly set is surprisingly from Aldi! They’re launched a bedroom range as part of their Specialbuys and it is available in stores from today, here’s a store locator for you! There are four designs of duvet cover, all in a gorgeously soft brushed cotton that is beyond cosy, even Arlo agrees! Now i’m no knitting expert but there are two different patterns, one printed on either side of the duvet, but a cable knit is definitely in there somewhere! I thought the brushed cotton might be a bit warm for this time of year but it’s made me no warmer than the plain cotton set we had on before, just feels so much nicer! 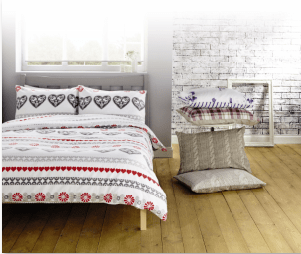 There is also a scandi-heart style design, a checked one and a floral style too! Prices for a King Size set are a very reasonable £14.99, with singles at £9.99. Along with the duvet cover sets they are selling a range of duvets, memory foam toppers, sheets, throws and ‘feels like down’ pillowcase protectors which are just £2.79 and have stopped the feathers from our pillows from leaping out and scratching us in the night! To check out future Special Buy ranges take a look here, and you can even email yourself a reminder if something really catches your eye! We were sent a duvet cover and pillow protectors for the purpose of this review. All words and opinions are my own. Love this! Such a nice pattern and it looks super cosy! I love a bit of Aldi – so this is music to my ears!